Air passengers have ignored a recent French air traffic controllers' (ATC) strike to travel with easyJet in increasing numbers. The low-cost air transport company, which is stationed in Luton, says it flew 6.9 million customers in May. This represents a 5.7% hike on the numbers seen in the same month last year. The upsurge comes despite a month which saw many cancellations. The ATC industrial action plus the EgyptAir disaster were behind many cancellations which frustrated holidaymakers. The latest figures also show that easyJet's load factor stands at 91.5%. Cancellations can hit travellers in the pocket, unless they play safe and take out travel insurance. This protects against flights being called off or delayed and the knock-on effect of connections being missed. It also covers lost luggage, mislaid passports and stolen holiday possessions. 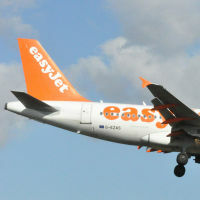 The latest passenger figures arrive less than a month after easyJet's half-yearly figures to March this year showed a £24 million loss. The budget air liner's half-yearly figure had stood at a £7 million profit only 12 months earlier. It says unfavourable foreign exchange rates had a £33 million impact. Experts also blamed the downturn on terror attacks and increased competition. British tourists can look forward to a price war and big savings this summer. Ryanair, among easyJet's main competitors, has already pledged to typically take 7% off the price of a flight over 2016. The promise comes in the wake of falling oil prices, overcapacity struggles and less demand. Michael O'Leary, its chief executive, says it will go even lower if its rivals try and compete on price.